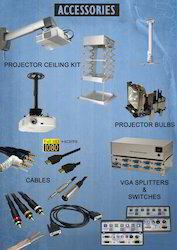 We are one of the leading suppliers of AV Accessories which includes Motorised Ceiling Kit, Non-Motorised Ceiling Kit, VGA Splitters, VGA Switchers, Projection Lamps and all type of Cables. Our products are quality tested by experts for excellent performance before sending to clients. These are formulated according to the exact requirements of clients. Moreover, our range of products are available in different customized forms and are offered at market leading prices. We welcome queries for Audio Visual Equipment from South India region including Andhra Pradesh, Karnataka, Kerala and Tamil Nadu. Looking for AV ACCESSORIES ?